The family of a man who was stabbed to death at a flat has described him as having a "heart of gold". Adrian Fannon, 39, and Mark Pawley, 25, were killed at a property in Newland Road in Banbury on 1 October. 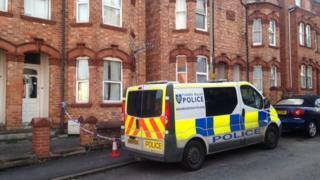 Raymond Morgan, 52, of Newland Road, has been charged with two counts of murder. Mr Fannon's family said in a statement he was the "ultimate loveable rogue who took a couple of wrong turns along the way". "He had a heart of gold and would help anyone he could," it said. "He was an affectionate son, brother and uncle. His nephews and nieces meant the world to him, he was so proud of them and he made them laugh, they adored him. "He was loved dearly by the whole family and his passing has left a big hole in all our hearts." The family of Mr Pawley previously said it was "devastated and heartbroken at the shocking loss of Mark who, behind all of his troubles, was a truly loved and loving person". Mr Morgan is due before Oxford Crown Court on 12 March 2018.